The Shoretrooper is probably the best one out of these, but I'm still not interested in getting him (however, I must admit that I haven't felt compelled to buy any new set in a long time). The rest of the figures just looks... creepy to me, with the Chirrut guy being the worst in that regard. On a side note, I know the source material enforces that but it's still dissapointing to see the color palette of CCBS being slowly reduced to bunch of greys, browns and black. I wonder how possible would it be for one of the unrevealed sets to be another Darth Vader? -we're in dire need of a new larger (call it Titan if you wish) set. It doesn't sound that unlikely when you think of it. It probably depends heavily on whether the unrevealed sets are based on a specific movie or series. If they're, say, Episode 8 sets, then Darth Vader's probably off the table. But if it's another wave of assorted movie characters like the first wave, he's more of a possibility. Personally, though, I would hope for more new characters in the next "assorted" wave. Still not loving the face molds, but definitely a lot of new interesting parts in there. Might pick up Chirrut for that bow. Some fantastic recolours in these. Shame they still rely on that godawful prefab torso frame though, a locked gearbox build would've looked a lot better on these guys, and would've been significantly more interesting to build. They really went all-out with the Shoretrooper. The amount of different colours on its arms is astounding. A definite must-buy! Chirrut and Baze look creepy as usual, but they seem to have some unique build techniques employed. I'm curious to see more! These are releasing in January 2017, right? Totally agree with you Aethersprite on the Shoretrooper. 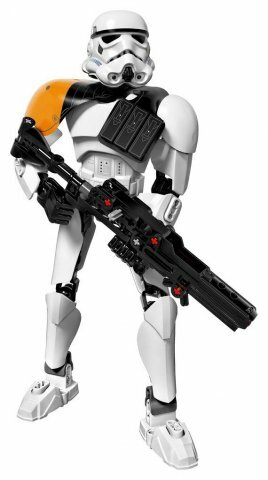 the armor design of him really appeals to me, since first images surfaced of this new trooper, and he rocks in Lego form too. Day one purchase for me. The other guys are better , than I expected, Chirrut's build is great and his face is almost resembles Donnie Yen, so IMO it's not that bad. On the other hand, Baze's head is really awful, looks like a 10 year old in a costume. A few wrinkles would made him more accurate and also better looking. Although I will buy all of them, as I collect each of these figs. Also I was on the same page with Jyn, I didn't like her at all, then eventually bought her and she is my favourite among the fleshhead builds. 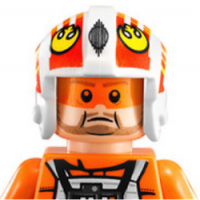 I don't really understand Lego's strategy on these human faces. For example, K2SO has a lot of tiny details and sculpting with subtle paint job, top quality. Then they make these simple, barely sculpted, barely painted human heads. I'm also curious, if they include a spear for Chirrut. Going crazy with all these recolors - the MOCcing possibilities just keep expanding! I haven't really paid attention to the Star Wars CCBS sets (as I haven't gotten around to watch the movies yet), but I like the new figures. Baze in particular looks nice with his Space Marine-esque neck section. Finally got around to seeing Rogue One (loved it! 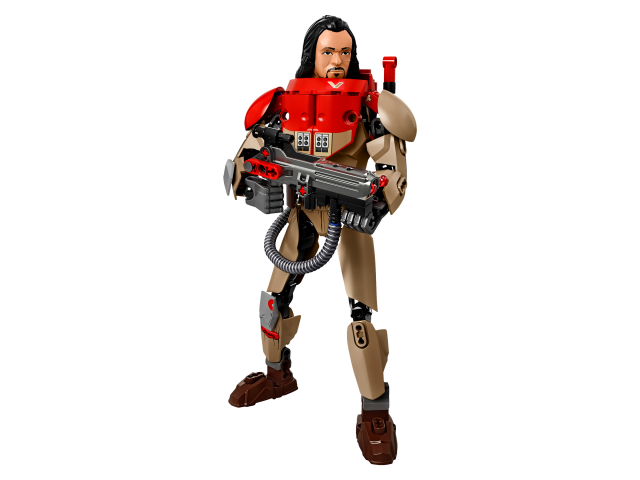 ), and I can say that it boosted my interest in the Baze Malbus and Chirrut Imwe buildable figures. They were both really likable characters, and the figures are really good likenesses of them. Both figures blend System and constraction to great effect for the neck/collar area of their costumes. They have a good selection of new recolors as well, even though some come with specialized printing or in limited quantities. 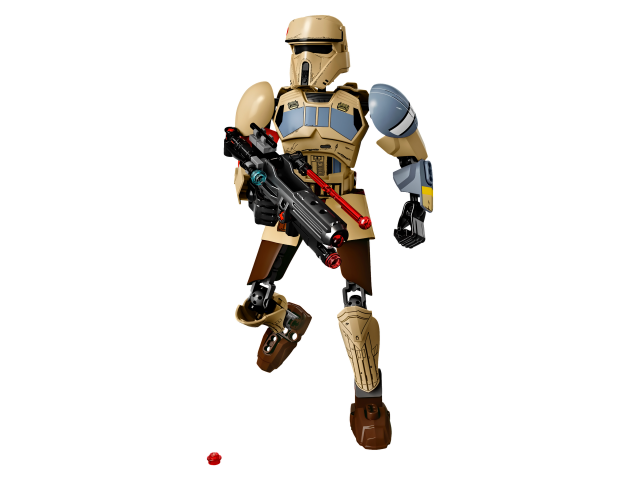 The Shoretrooper has more interesting colors than many previous trooper-type sets, but has a number of somewhat specialized prints and a very specialized helmet. I still feel much more drawn to the figures with human faces, which seem to have more character and more versatility. Last year's Jyn Erso figure is also still somewhat appealing to me, and I haven't gotten it yet, but Baze and Chirrut have more interesting outfits, IMO. Also she's got that hat, which I can't even remember if she wore in the movie? Certainly she didn't for most of it. The head would have felt both more recognizable and more versatile without the hat. The main character I'm disappointed NOT to see as a buildable figure so far is Saw Gerrera, who would make for a very distinctive build. 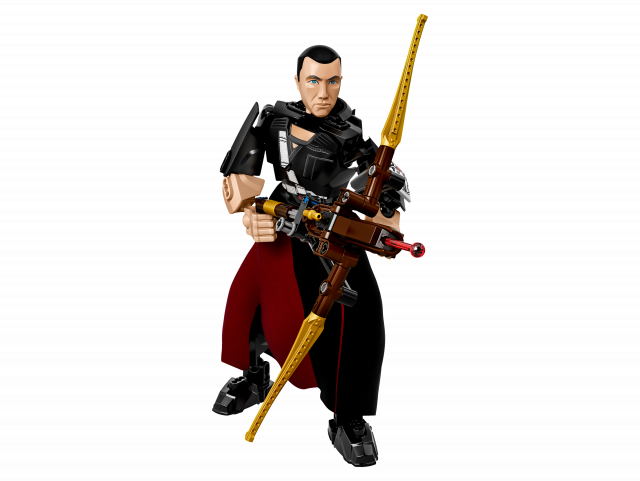 I really like the unfolding gimmick that Chirrut has for his bow. I might have to try that for my Umarak mod when I get back home. Since the new sets are out in Europe, I've bought the Shoretrooper (which is actually called Scarif Stormtrooper on the french version of the s@h) and Baze Malbus. Also she's got that hat, which I can't even remember if she wore in the movie? 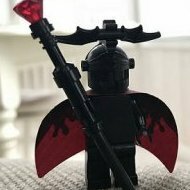 I agree with Saw - being part mechanical, he would make for a great CCBS build where the style would actually fit his body. I'm afraid his somewhat limited role in the film may damper his chances of getting a figure, although it's not like Shoretroopers got a big focus either. It's possible that we might get a Saw figure if we ever get a wave based on the Rebels cartoon, since Saw is apparently coming to that show as well. I think figures like the Shoretrooper get figures over named characters with more prominence largely to provide some sense of balance between "good guys" and "bad guys". Rogue One has very little in the way of named villains who can really go toe-to-toe with the rebel heroes in battle. Krennic never uses anything but a small blaster, Tarkin never wields any sort of weapon at all (well, unless you count the Death Star, but you can't exactly put that in a set), and Vader's already been depicted. Honestly I hope we get to see Darth Maul, Qui Gon, Mace Windu, Yoda, C3P0, Anakin, Dooku, Super Battle Droid, Han, Chewie, Leia, Bossk, IG88, or Saw at some point. 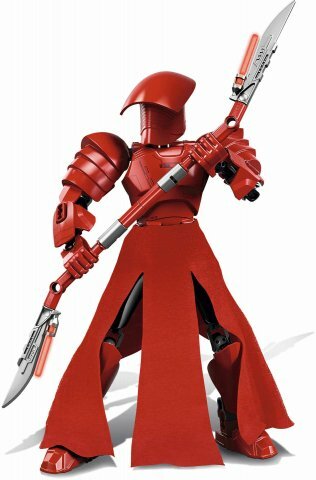 Im honestly surprised they havent done Maul yet. It's a consequence of the high density of new Star Wars movies being released. The only "legacy characters" we've gotten so far are the six figures that were initially released (in which the three villains seemed chosen deliberately to offer variety in the form a force-user, a droid, and a non-force-using human). Since then the only figures we've gotten have been tied in with new movies (The Force Awakens and Rogue One). It'd be nice to get figures based on characters from other media again but with a limited number of sets and one new movie each year the opportunity just hasn't presented itself. Yeah thats understandable. Im just hoping that we get at least a few since Ep8 might not be full of new characters. What with a Vader-styled but detailed version of Kylo Ren? 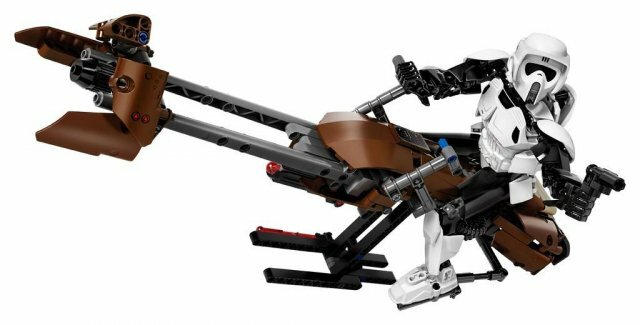 It could be cbetter than the small one we had, but I agree with @legozebra that it's be cool to see updates versions of the TFA ones, but as for now, one can dream! I can definitely see the possibility of getting repeats of main characters if their outfits change, but if they don't then I would probably expect them to be replaced by new characters. 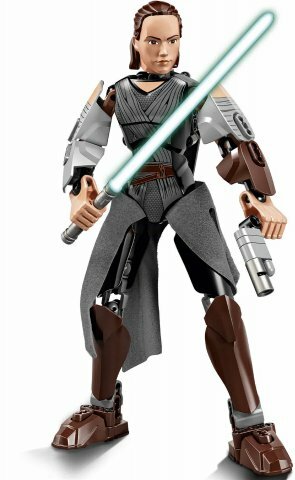 I would certainly be happy to get a Rey that lacked the bulky headwrap from the original figure. It would be nice for sure. The current Rey is ruined by that headgear thing. I dont know why LEGO wont do female heads with hair. But with Baze coming out then maybe theve changed their approach to head pieces. I've read a rumour about Snoke being physically present in the next movie, and apparently he's quite tall, so he could make an interesting set. Alternatively, a Rebels wave could be interesting, at least to bring the classic Imperial Stormtrooper in CCBS form. It would also give them the opportunity to make a Darth Maul set. I, for one, would really like to see Sabine and Hera as Constraction sets. Here's the pricing from one retailer. Take note these are Google-translated names. Don't ask me why the battle packs have Speederbikes on them. Looks like 1) we finally get our first constraction OT Stormie and 2) our first constraction vehicle since Speeda Demon!